Chipotle Chickpea Chicken Soup | "Il faut goûter"
It’s starting to feel like fall, which means I’ll soon be consuming a significantly larger quantity of three things: tea, mulled wine, and soup. Who among us doesn’t need a bit more warm comfort when the weather gets chilly? 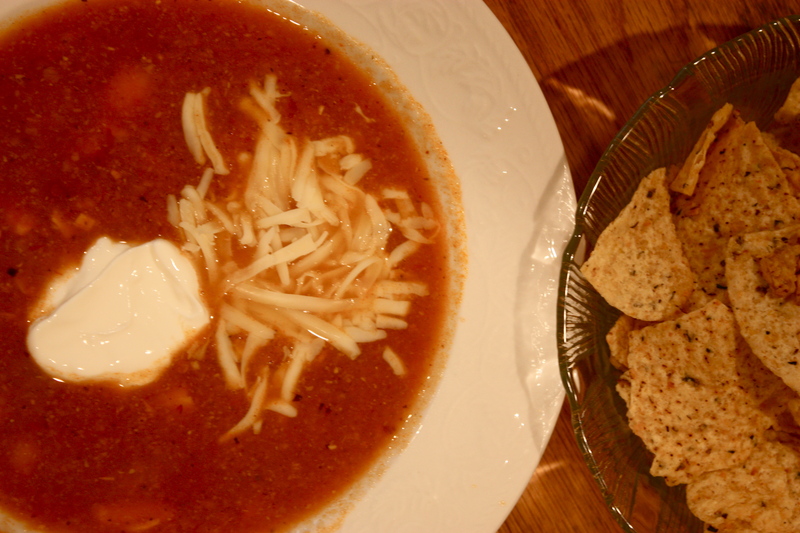 Here’s an original soup recipe that is sure to keep you warm. The flavor will remind you of chili, but the chickpeas are a nice textural twist. The chipotle pepper gives it some heat, so if you or your people don’t like things spicy you may want to leave that out. (If you like it really spicy, add two peppers! One gives a nice amount of spice and smokiness.) And I didn’t do it this time, but fresh or frozen (thawed) spinach would be nice stirred in at the end! Get ready for pretty golden trees and warm things in your belly! In a large pot, sauté the onion and garlic in the oil until translucent. Pour in the water and add the boullion cubes. Pour in 1 can of chickpeas and the can of diced tomatoes. Add the cumin, oregano, allspice, and chipotle pepper (plus a bit of adobo sauce from the can). Bring this to a simmer; simmer for about 15 minutes. Return the pot to medium heat and pour in the other can of chickpeas and the cooked chicken and stir. Simmer for another 15 minutes. Taste for seasoning. Serve with garnishes such as shredded cheese, sour cream, and chopped green onion. Tortilla chips are nice on the side. This entry was posted in Savory and tagged chipotle chickpea chicken soup, food, recipe, spicy chickpea soup by needtotaste. Bookmark the permalink.